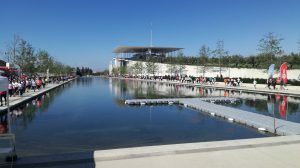 The most important kilometres were covered by SARMED in April 10-14, at the Stavros Niarchos Foundation Cultural Centre, not by trucks, but on foot, for the charity race supporting the Association “Together for Children”. In spite of the unstable weather conditions, SARMED’s team managed to offer 183km at the 3rd NFL charity race. Many congratulations for the 12,000 participants for their touching effort. A total of 111,006 kilometres were covered in 90 hours, translated to 55,503 euros for children in need. 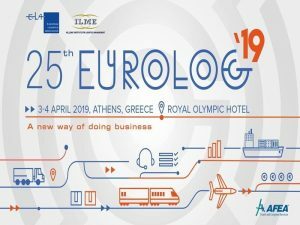 The 25th European Congress, EUROLOG 19 took place on 3-4 April in Athens. 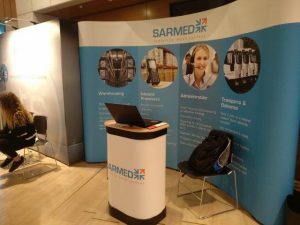 SARMED supported the European event as a sponsor and rapporteur of our field. Executives from Europe and our country approached the key theme of the congress “A new way of doing business”, highlighting changes across the supply chain due to economic, technological and environmental developments. At the session “Intelligent Transport Systems (ITS)/Last mile” of the second day, Messrs. Dimitrios Karagiannis (3PL Business Unit Director) and Antonis Danopoulos (IT Director), presented “SARMED distribution/delivery system” from its operational and technological perspective, highlighting SARMED’s strategic investment in the transport network and new technologies to meet the ever-increasing needs in the Logistics / transport services market. On 13 March 2019, the first trial of the digital transport documents (e-CMR) was carried out by SARMED. The formal launch of the pilot project in Greece under the European AEOLIX program is part of a wider strategy to digitize transport documents as a tool to facilitate trade and enhance supply chain competitiveness by increasing efficiency and at the same time reducing administrative costs as well as the environmental footprint. The pilot project in Greece is co-ordinated by the Hellenic Federation of Road Transports (OFAE), which is one of the 5 members of the International Road Transport Union (IRU) participating in AEOLIX together with the Ministry of Infrastructure and Transport. SARMED expresses its warmest thanks to OFAE for the selection, trust and its support throughout the project. In a consortium with TRAINOSE, SARMED submitted a file of interest for the International Tender “Concession Contract for the operation, maintenance, exploitation, completion of studies and construction of projects, and procurement of equipment for the Thriasio Freight Centre”. The duration of the concession is set at 25 years, the Contracting Authority is the General Secretariat for Infrastructure – General Directorate of Transport Infrastructure of the Ministry of Transport and the Competition will be conducted in two phases: a) Expression of interest; and b) Binding tenders, the basic, technical and financial parameters of the project and will finalize the draft concession contract. We are pleased to announce our new partnership with MADEL FOOD, which maintains the rights of the famous French chain of bakery PAUL, in Greece and Cyprus. Boulangerie PAUL’s first acquaintance with the Greek public was made in 2010, while 4 stores with on-site bakery and confectionery production in Attica are operating to date. All PAUL stores use their own flour, from their own producers who cultivate varieties exclusively for the chain, producing superior quality food. 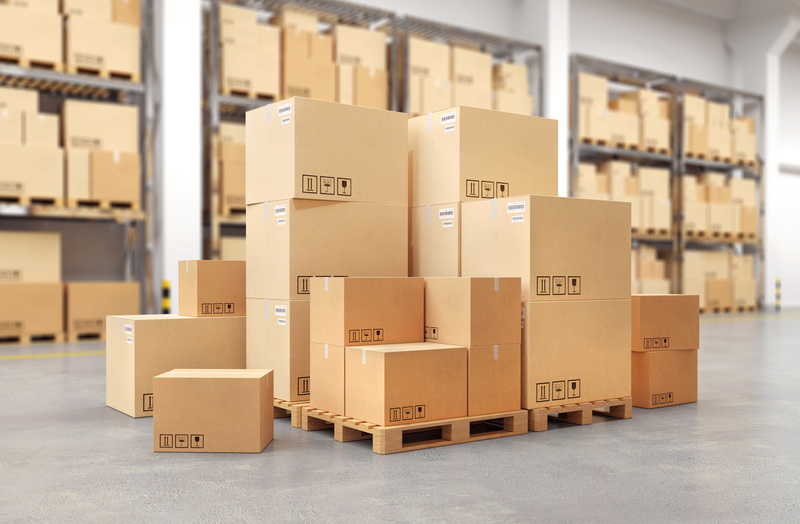 The collaboration concerns the provision of logistics – storage and distribution services, in all temperature conditions, as well as return management. Reinforcing the development of Logistics in Western Greece and the Peloponnese, SARMED supported the event as a major sponsor, which was organized by the Operations Center on Tuesday, February 26, at the TEI Western Greece Conference Center in Patras. Mr. Charalampos Siaflas, Logistics & Commercial Director of SARMED and Vice President of Finance of the Hellenic Logistics Company, addressed the opening of the event and Mr. Nikos Dimakopoulos, SARMED Regional Manager of Western Greece, was among the executives from other distinguished companies and institutional bodies, who presented the topic “Customer Satisfaction – Guide for Cost Reduction and Increase of Profit”. 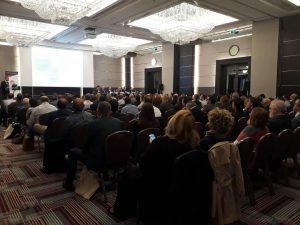 With great success and vast participation from the business world of Northern Greece, was the 6th Logistics SOLUTIONS Conference in Thessaloniki held on Tuesday 05/02. The conference presented Logistics models of the companies located in the wider region, the particularities of the Route to Market as well as the Logistics market in terms of infrastructure, providers and urban distribution. SARMED supported the conference as a sponsor, while Mr. Dimitris Karagiannis (3PL BU Director of the company) participated in the Round Table discussion on the particularities and costs of supplying the market in Northern Greece, highlighting the benefits to be gained by the commercial firms if they concentrate on their core business and outsource specialized supply chain operations and support activities in general. The new year has begun with a flagship collaboration for SARMED who is particularly pleased to announce its cooperation with GREGORY’S, the largest coffee and food company in Greece. The cooperation concerns the provision of integrated logistics services, the distribution to GREGORY’S nationwide network of stores, as well as return management. In this way, SARMED strengthens its leading position in the 3PL industry and especially in the management of the particularly demanding category of combined controlled temperature foods. GREGORY’S with a history of almost half a century, is the oldest, largest and most successful brand of coffee and food in Greece, with a network that currently exceeds 330 stores in Greece, Cyprus, Germany and Romania. Furthermore, it is distinguished by the innovation in the catering sector, with products and services of superior quality which address the eating habits of the modern Greek and ‘acts’ with total respect towards people and the environment. 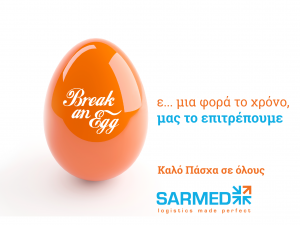 SARMED is the most dynamically growing 3PL company in Greece, with a leading position, the largest storage facilities (reaching 160,000m2 across Greece), the most complete nationwide transportation network, with absolute specialization in food & under refrigerated conditions and with an estimated revenue for 2018 approximately 29,000,000 €. SARMED welcomes the election of the new Board of Directors of the EEL and is particularly pleased and satisfied with the election of its commercial director, Mr. Babis Siaflas to the new Board of Directors as Vice President of Finance. We wish every success to the new Board of the EEL for the significant task which it is called upon to continue and of course to our executive for his new duties. 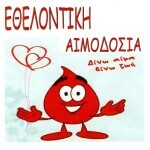 The participation of SARMED’s employees reached a new high record at the voluntary blood donation. SARMED’s blood donation team contributed 46 valuable units this month to help our fellowmen who have immediate need for blood. The total supply of SARMED’s blood donation team is 386 units, from the first donation to date. SARMED participated and sponsored the Logistics Conference “Logisticians <40 specify Logistics 4.0” which took place on October 17, 2018 at the Stavros Niarchos Foundation Cultural Center, organized by the Supply Chain Institute and the scientific support of Planning, which focused on the changes brought to the Supply Chain through technological developments. Furthermore, SARMED was a gold sponsor at the “Enterprise Document, Content & Knowledge Management for optimum operational performance” congress organized by the Operations Center on November 1st at the GRAND HYATT ATHENS. The executives of SARMED, Messrs. Dimitrios Karagiannis (3PL Business Unit Director) and Alkis Papadopoulos (Document Flow Manager), presented the application of new trends and technologies in SARMED document management processes. SARMED is pleased to announce its collaboration with Barilla Hellas, one of the largest food companies in Greece and a leader in pasta and sauce. The cooperation involves the transportation, namely the distribution of Barilla products from its premises in Thebes to its sales network throughout Greece. 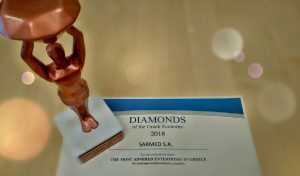 At the event held at the Hotel Grande Bretagne on July 3 to award the “Diamonds of the Greek Economy 2018”, SARMED was among the companies that distinguished themselves from other Greek and multinational groups. In this established institution, companies with sound economic financials and remarkable growth are selected and awarded. It is worth mentioning that SARMED was the only company from the logistics industry. The prize was received by the Chairman of SARMED, Yiannis Ch. Sarantitis, who pointed out among other things, that this success is due mainly to the company’s people and the working environment created to maximize the joint development of the company and thus their personal development. 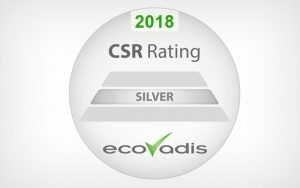 SARMED received the “Silver Recognition Level” distinction from EcoVadis for its corporate social responsibility performance in 2018. EcoVadis is an international platform that allows companies to monitor the sustainability performance of their suppliers. Its methodology covers over 20,000 suppliers annually from 194 sectors and 140 countries. The system analyzes and evaluates the performance of the company in four main categories: Environment, Labor and Human Rights, Fair Business Practices and Sustainable Procurement. The ECOVADIS rating ranked SARMED in the top 30% of all companies in all sectors worldwide, while in the 4 categories the SARMED performance was above the industry average. These pillars are reflected not only in this certification but also in the way the company operates by incorporating them into the Integrated Management System. SARMED, in the context of its growth plan, announces the expansion of its storage and Distribution Centers by creating a new facility in Patras. With the development of its own network and more comprehensive geographical coverage, SARMED aims to better control its operation and provide more efficient and competitive Logistics services in Southern and Western Greece. The new DC is located at the exit of Ovrya of the peripheral road of Patras and consists of 6,000 m² open and 2,000 m² sheltered storage space. In addition, SARMED has invested in the creation of 200 m² cooling chambers for crossdock management of all types of temperature-controlled products, a category which requires high expertise and experience. SARMED participated in the 7th National Metrology Conference, co-organized by the Research Institute of Communications and Computer Systems (ICCS), the Hellenic Association of Laboratories-HellasLab and the National Technical University of Athens. SARMED presented methodologies for measuring carbon footprint in the supply chain based on international standards as well as the results of the calculations for the transportation and distribution of a specific product category from Athens to destinations throughout Greece. The work was presented by Dr. Dimitrios Theodorou (Quality and Food Safety Manager), developed in co-operation with Toai Truong (Project Manager and Quality Assurance Associate) and George Fardis (Transport Manager). In order to demonstrate its interest in the safety and health of its employees and all stakeholders involved in its operation, SARMED has developed and implemented a health and safety management system in accordance with OHSAS 18001. 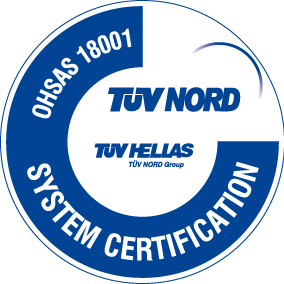 The implementation of system was successfully audited by the TÜV Hellas Certification Body (TÜV Nord Group). 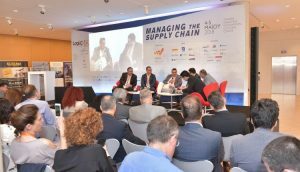 The 10th annual event LOGI.C 18 on ‘Managing the Supply Chain’ at the Stavros Niarchos Foundation (SNFCC), was successfully hosted on May 4-5, by o.mind Creatives. Thematic units and findings of pioneering research attracted the interest of executives from the business market while focusing on modern transportation and distribution networks, both within and outside the borders. SARMED supported the conference as a sponsor, while Mr. Charalampos Siaflas (Logistics & Commercial Director of the company) participated in a roundtable discussion on the first Pharma Cosmetics Impact Survey and their Supply Chain by Optilog & o. mind Creatives. 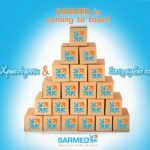 SARMED announces its cooperation with ARYZTA GREECE for vertically integrated logistics (storage and distribution) services at freezing temperatures across a nationwide network. In this way it accelerates its penetration in the field of cold load management, utilizing the recent investment of upgrading and expanding modern temperature controlled storage facilities. ARYZTA GREECE is a member of the international group ARYZTA AG with a turnover of 4 billion euros, which holds the 1st place in frozen B2B bakery. The SEV investment conference “Planning the Future with Investments” was successfully held on 23-24/4/2018 at the Divani Caravel Hotel, revealing the need and characteristics of a friendly investment environment. A special honor for SARMED was the participation of Mr. Yiannis Sarantitis, Deputy Managing Director, at the Round Table discussion on “Investment in logistics, ports, airports”. Mr. Sarantitis expressed the ability of the domestic 3PL market to face international competition, the investments required to ensure that Greek logistics attract international customers but also meet domestic trade needs, especially in tourist areas. Finally, reference was made to the degree of concentration and partnerships in the field. A few days ago, the founder and Chairman of the BoD of our company, Charalampos Sarantitis, passed away. On behalf of the SARMED family, I would like to offer a last salutation to the human who brought new morals to the business world, the man who has shown the way and has shaped the strong human-oriented culture we have all inherited and continue to follow. His emblematic personality, his restless and open spirit, his sincere and dignified attitude, his immediacy, his simplicity and even his mocking attitude at times, his constant effort for the common good, have left a mark on us and are our example and our inspiration. Perhaps even more than his business activity, we will remember him for his social contribution and his charitable work, which derived from his deep love for God. In a difficult time for the economy and society where respect for the role and value of mankind is continually deteriorating, we have learned from him to recognize, appreciate and promote the value of human relations, solidarity and the effort for joint progress. No matter how much we have grown or how much we will develop in the future, we will not cease to act in the light of the principles that he inspired us. The constant effort for innovation, excellence in services and business development is not real and sustainable unless it is focused on humans and their personal development and well-being. And beyond all the above, what will remain in our memories is always the open door of his office, his open heart, his warm attitude, but also his warm words, whether he was talking to a ministry official or to the neighborhood chestnut vendor. SARMED announces its new cooperation with PESCANOVA HELLAS for vertically integrated storage, distribution services throughout Greece and repackaging under freezing conditions. PESCANOVA HELLAS is a subsidiary of a multinational group and is active in the import/trading of fresh and frozen seafood. SARMED, in the context of its development and further penetration in the food industry under controlled temperature conditions, announces the launch of its cooperation with KONTOVEROS for vertically integrated storage and door-to-door distribution throughout Greece. KONTOVEROS, founded in 1968, is active in the import, export, trading, processing, standardization, packaging and distribution of frozen seafood. Furthermore, the company produces delicious innovative products (burgers, sausages, kebabs and delicacies) from seafood. KONTOVEROS has currently gained a market share of over 25% and has significantly increased its export activity, being the most dynamically growing company in its sector. The 5th SOLUTIONS Conference with the topic: LOGISTICS PEST (Political Economical Social Technological) ANALYSIS – Challenges and solutions in the new institutional and economic environment by the Supply Chain Institute, was held on Tuesday 13/03. The conference analyzed the overall Logistics market environment and presented technical solutions and applications to effectively address contemporary issues that affect the day-to-day operation of each enterprise’s supply chain. SARMED supported the conference as a sponsor, while Mr. Dimitris Karagiannis (3PL BU Director @SARMED) participated in the panel discussion on the environment, the operation and the prospects of the transport companies (agencies) market, presenting the business model of SARMED’s nationwide distribution under controlled temperature conditions. SARMED is pleased to announce the completion of the investment to upgrade the existing temperature controlled storage facilities and the expansion of 2,000 pallet deep-freeze chambers to meet the ever-increasing storage needs of products under controlled temperature conditions. The investment exceeded € 1,500,000 while the company is already in advanced discussions for commercial agreements with companies operating in the refrigerated food industry. 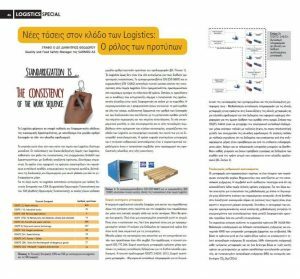 Publication of an article entitled ‘New trends in Logistics: The role of standards’ in SCL Magazine, by Dr. Dimitris Theodorou, Quality & Food Safety Manager at SARMED. 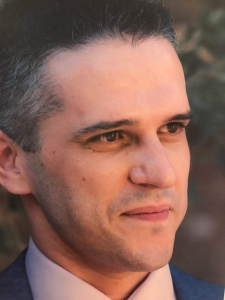 Antonis Danopoulos has taken the role of IT Director at SARMED from the beginning of 2018, as the company has decided to invest dynamically in the IT sector in order to maintain its competitiveness and high growth goals in an ever-changing environment. Over the last nine years, he worked as IT Director of SPEEDEX courier company implementing major IT projects. Manage a competent team of internal IT professionals and external IT companies. Create the new IT strategy (new technologies and investment plan) for years to come. Support and improve all key software applications (WMS, ERP, Fleet Management, POD etc.). Maintain and expand company’s infrastructure (Computer Room, RF Scanners, Security Systems, Warehouse Systems, etc.). Support and redesign SARMED’s telecommunications and internal networks. Mr. Danopoulos, with his knowledge and expertise, will not only help with the smooth and continuous operation of company’s information systems and infrastructure but will also contribute in realising SARMED’s vision and strategic goals. We welcome Mr. Danopoulos to the SARMED family and we wish him every success in his new duties. 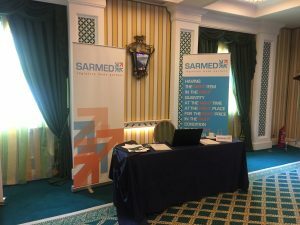 SARMED, within the framework of its Pharma logistics market placement strategy, supported both through sponsorship and with its presence of its executives at the 11th Conference of Pharmaceutical Management. The conference took place on 7, 8 and 9 February 2018 at the Megaron International Conference Center in Athens, entitled “Pharma 2020: Trust – Collaboration – Value”, organized by the Hellenic Society for Pharmaceutical Management (E.E.PHA.M). The audit process of SARMED’s Integrated Management System by TÜV Hellas Certification Body (TÜV Nord Group) was successfully completed and the relevant certificates were issued. More specifically, the certifications granted were the new version of ISO 9001:2015 and the transition from HACCP to ISO 22000:2005 regarding food and beverage safety. In addition, the validity of the Certificate of Good Practice for Storage and Distribution of Medical Devices was renewed in accordance with Ministerial Decision 1348/04. The confirmation of the effective implementation of the Integrated Management System is one more evidence of our commitment to operate by providing our partners with high quality services that meet their needs and expectations. Aiming in long-term contribution to people and the environment, SARMED a leading logistics company is continuously strengthening its social footprint by focusing on initiatives and actions which are implemented through partnerships with various institutions. In 2017, SARMED donated a significant amount of money to ‘The Smile of the Child’ and the Hellenic Society ‘iElpida’, aiming at strengthening organizations that are close to children. At the same time for many years, the company has maintained long-term partnerships with the organizations ‘Theofilos’, ‘Meropio’ (care center for elderly people) and the International Solidarity & Cooperation Centre (KEDAS) offering its services as well as essential goods to vulnerable groups. Among these actions, SARMED’s people recently performed the 10th voluntary blood donation, having collected a total of 313 units of blood (from 2012) for the National Blood Donation Center, thus being consistent with the social work of the company. The 21st Panhellenic Logistics Conference, organized by the Hellenic Logistics Company of Northern Greece in Thessaloniki, was successfully completed on November 25th. Modern trends in logistics were analyzed and interesting cases on transport infrastructure, new technologies, best practices and research developments in the supply chain management, were presented. Due to the vast attendance, the participants were thoroughly informed about the trends and developments of the industry, both from presentations and round table discussions. SARMED being a sponsor at this important congress also presented through its executive, Mr. Dimitrios Karagiannis (3PL BU Director of the company) the important data on e-logistics and the new challenges in the supply chain. After a long-term cooperation for storage and transportation services throughout Greece, TOYOTA HELLAS renews its trust in SARMED by expanding its range of services. SARMED now offers full technical services to TOYOTA HELLAS for all vehicles registered in Greece. These services include cleaning, pre-delivery (P.D.I.) and implementation of promotional campaigns. SARMED is also pleased to announce the transportation and distribution of SKODA vehicles to Kosmocar’s official network in the Greek territory. Kosmocar, being the official importer of VW, Audi, Bentley, Lamborghini & Bugatti and Ducati motorcycles, has expanded its portfolio by taking over the importation of SKODA vehicles. SARMED was a sponsor at the conference “12 Case Studies from the supply chain to the value chain”, supported by the presence of executives and partners. 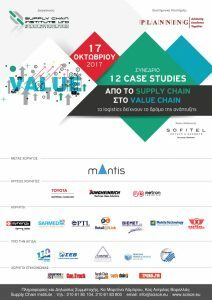 The conference was organized by the Supply Chain Institute on Tuesday, October 17, 2017, at Sofitel Athens Airport and was particularly successful both in presentations and participations. August 2017 | Commencement of cooperation with METRO S.A. 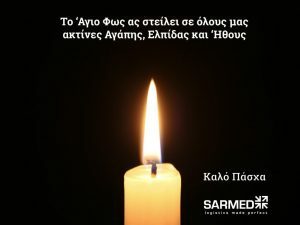 The new cooperation of SARMED concerns the storage, preparation of orders and the transfer of seasonal items of METRO S.A. METRO SA is a 100% Greek company with activity in the retail sector since 1976. It has two types of chain stores: METRO Cash & Carry wholesale consisting of 48 outlets and ‘My market’ supermarkets with strategic locations all over Greece. In February 2016, METRO SA acquires the Veropoulos chain (founded in 1973) and the two historic Greek companies are united by creating one of the largest retail companies in the Greek market. The acquisition of the Veropoulos branch network increases ‘My market’ sales points to 223, covering strategic locations in every corner of the Greek territory. METRO SA, for over 40 years now, serves the Greek market consistently and reliably, supporting the Greek worker, the Greek entrepreneur, the Greek producer and the Greek consumer. July 2017 | New cooperation with Pharmex S.A.
As part of its broader business activity and strategic positioning in the pharmaceutical field, SARMED took over Pharmex’s transportation service. 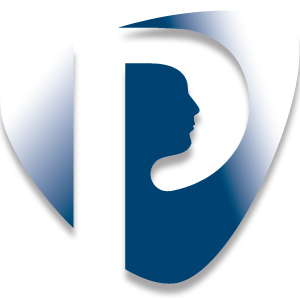 Pharmex S.A. being a leading trader for 34 years in the field of dermatological and cosmetic products, maintains long-standing partnerships with multinational corporations as an exclusive importer of foreign brands (i.e. EUBOS, Dr. Brown’s). SARMED participated in the workshop organized by the Hellenic Federation of Road Transports, in collaboration with the International Road Transport Union (IRU) and under the auspices of the Ministry of Infrastructure and Transport on 22/6 in Thessaloniki. During the round table discussion, Mr. D. Karagiannis, 3PL Business Unit Director, expressed the expectations of the implementation of e-CMR and the future digitization of Delivery Notes. The above implementations will result in economic benefits, reduction of processing time, environmental friendly management, easier invoicing, direct data exchange, accurate data logging, real time information on receipts and deliveries of goods. 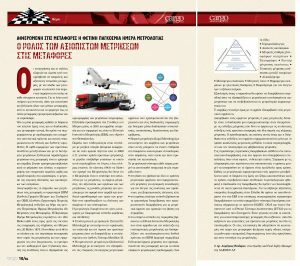 Publication of an article entitled ‘The role of reliable transport measurements’ in SCL Magazine, by Dr. Dimitris Theodorou, Quality & Food Safety Manager of SARMED. The workshop in e-commerce logistics, organized by OPTILOG Advisory Services and O. Mind Creatives, was successfully completed on Saturday 17/06. SARMED, being strategically positioned in e-commerce logistics, sponsored the event and presented the case study of its collaboration with Media Markt’s e-shop, developing the operating model and e-commerce logistics processes, as well as the means of service to the final consumer. Furthermore, general trends and data were presented for the Greek and global market, as well as KPIs from the existing cooperation between the two companies. May 2017 | New cooperation with 3D Food Services S.A.
SARMED is pleased to announce the new partnership with 3D SA, a company that has been active in catering for more than 20 years. The collaboration concerns the integrated management of all its products (transportation, storage, value added services, distribution) for both dry and cold (including deep freeze) cargo. May 2017 | SARMED new website on air!! SARMED new official website is a fact! It integrates aesthetically the company’s features and reflects our corporate identity and culture. It is contemporary & simple in design, easy & pleasant in browsing. It instantly provides the visitor with clear and condensed information about its activities and other functions. It implements latest technologies such as sliders, responsive design for automatic customization on mobile devices, use of icons (vector svg files) as well as information for easier access to service points and use of Google maps pin per location. Most importantly … it is dynamic and in the future will incorporate other features and functions for partners, customers and the wider audience. We invite you to browse, enjoy and spread it! SARMED, being a strategic 3PL services partner for Media Markt since early 2016, takes over the storage and supply chain services of the new store in Patras. It has set up the appropriate network for the convenience of home deliveries for both the Achaia prefecture and for adjacent counties (Ilia and Etoloakarnania). As part of this expanded partnership, SARMED is responsible for the storage of goods, preparation of orders, the supply flow of the store, the B2C distribution of orders, the cash on delivery for home deliveries and return management (reverse logistics). The expansion of cooperation between the two companies on the Patras surrounding area creates the conditions and sets a strong foundation for a solid nationwide distribution network providing high quality services to its chain customers. SARMED received a gold award at the ceremony of the Transport & Logistics Awards held on 07/02/17, highlighting the best practices and innovative applications of commercial enterprises, industries, 3rd Party Logistics companies and other transport infrastructure. Specifically, SARMED was the winner for the category ‘Optimizing Circuit of Transportation-Distribution’ with the project: Optimization of P&G and 3M deliveries at MASOUTI’s central warehouses through the combined transportation network of SARMED. 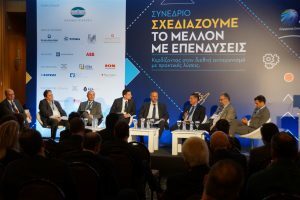 The ceremony attracted 300 high ranking executives from the largest companies related to the transport and logistics industry in Greece, demonstrating the dynamic of this event in the field of Transport and Logistics. Roupas A. I raklis Ltd operates and holds a leading position in raw coffee imports from several countries (Brazil, S. Africa etc.). The sales network consists mainly of the largest wholesalers and HO.RE.CA. points. As part of its development, but also because of imminent excise tax to be imposed on coffee products from 1.1.2017, the company decided to strategically change their logistics model from in-house to outsource (3PL). Therefore, after completing its research on the 3PL market, ROUPAS chose SARMED as a partner for the provision of logistics services. 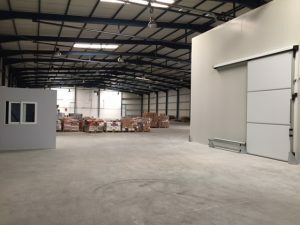 With the use of storage space of about one thousand square meters in SARMED’s facilities in Mandra under customs warehousing, ROUPAS will service at least 800 tons of permanent stock. In addition to storage services and inventory management, SARMED shall also provide ordering services and will be responsible for unloading pallets of goods, stacking and accounting management. Given the specialization of SARMED (among others) in the product category of food and beverages, as well as due to high expertise and decades of experience in customs warehouses, systems and procedures, ROUPAS’ choice was inevitable. The management of SARMED would like to warmly thank ROUPAS Ltd. for its trust and welcome the new partnership by committing to high quality of services. 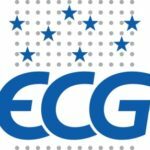 SARMED executives Y. Sarantitis and D. Kympizis attended the 2016 ECG conference (Association of the European Vehicle Logistics) which was held in Hamburg, Germany on the 20 & 21st of October. Megatrends in car manufacturing industry and their effects on vehicle logistics sector, as well as innovation and performance excellence through digitalization of the logistics circuit were the main thematic axles of the conference. SARMED execs had also the opportunity to visit certain service areas of Hamburg port such as the car terminal & the container depo and to learn about the activities, procedures and practices of one of the top European ports. 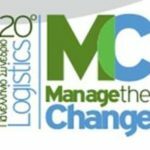 SARMED participated at the 20th National Logistics Conference of EEL “Manage the change” not only as a sponsor (as every year), but also with the active attendance of its executives : Y. Sarantitis, B. Siaflas and D. Karagiannis on targeted thematic presentations and panel discussions, referred to transformation and development of the logistics environment through innovation and synergies. This is the 1st International Innovation and Humanitarian Planning Workshop which was held in Lesvos in October, focused on open source design applications and 3D printing in the design, manufacture and supply of basic relief items which are distributed to global humanitarian crises. An international team from the Netherlands, Sweden, Syria, United Arab Emirates and Greece, worked in the humanitarian field of Lesvos alongside non governmental organizations, universities, research institutions and companies active in humanitarian design, to create improved products and processes through innovation. SARMED participated as a sponsor, undertaking transportation and supply of equipment for the whole project. Commencement of cooperation with Thrace Flourmills, a leading company in the field of production of bakery and confectionery products. Thrace Flourmills, with a course of almost 100 years, is a Greek family business that has grown into a modern company which not only respects tradition but simultaneously embraces innovation and has an eye for the future. As a result, one of the decisions was to entrust the entire supply chain service in the form of outsourcing, to a 3PL provider. SARMED is delighted to be working with a company that shares the same values and culture, is people-oriented, pursues excellence in every field and has a customer-focused philosophy. 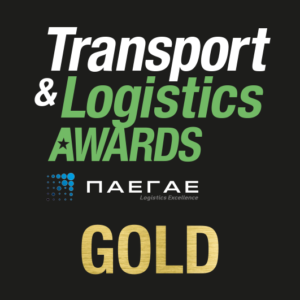 Consistent in supporting institutions and organizations that promote the Greek community of Logistics, SARMED proceeded to the Gold Sponsorship of the Institute of Logistics Management Greece, a member of the European Logistics Association. ILME is a scientific non-profit organization that highlights the importance of logistics for businesses, the extroversion of Greek companies in their sector, training and certification of personnel and a number of other conference and scientific actions. MINERVA, a pioneering Greek company in the food sector with major exporting activity, entrusts the management of its supply chain to SARMED. This cooperation appraises the best know-how and expertise of SARMED in the food sector and the constant effort for excellent services, as MINERVA is well-known for its high standards throughout their range of procedures. The services offered concern transportation, storage, sorting and distribution of dry cargo and maintenance products to MINERVA’s network. SARMED would like to express its gratitude towards MINERVA and commit to effective high quality of services. SARMED’s blood donation team contributed 32 valuable units of blood this month to help our fellowmen who have immediate need for blood. The total supply of SARMED’s blood donation team is 240 units of blood, from the first donation to date. April 2016 | HAPPY EASTER! With great pleasure, SARMED proudly announces its collaboration with the German multinational electronics retailer company, MEDIA SATURN. This is the third and largest cooperation of SARMED in the field of e-shops management, a sector with great potential and perspective and with special attention to the development strategy of the company. The object of the cooperation is initially the management of the e-shop of Media Markt for all its products, while except for white and black appliances it is also extended to general home furnishing products. SARMED is pleased to announce the start of cooperation with the exclusively Greek import and trading food business, PASSALIS SA. With a course of decades in the food area, PASSALIS company is an example of a family business that has withstood the difficulties of time and has strengthened its presence in a highly competitive environment. The cooperation refers to the integrated management of all its products (transportation, warehousing, value added services, distribution) in dry cargo as well as cold storage, including deep freeze storage. The importing company with a leading position in the field of gardening/fields/ forest machinery, P. PAPADOPOULOS SA, with numerous brands including Husqvarna, Gardena, Mc Cullock etc., assigned the vertically integrated supply chain management of its products to SARMED. We welcome the new cooperation with an exclusive Greek company that is distinguished for consistency, professionalism and continued growth, based on healthy partnerships and solid financials. The very successful 19th Panhellenic Logistics Conference took place on Friday, 20/11 and Saturday, 21/11 at the Zappeion Hall. This year’s event touched the highest level both in terms of organization and topic discussion, including the speakers, the general participation and the quality characteristics of the participants. Particularly encouraging was the participation of the State through the competent bodies. 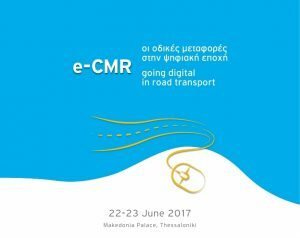 More information can be found in the press release of EEL (PRESSFINAL_19thPANHELLENICLOGISTICSCONGRESS). 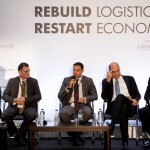 SARMED, who is consistent in all events and activities that promote Greek Logistics, participated not only as a sponsor but also had an active participation with its executives: Yiannis Sarantitis (Deputy Managing Director) in the panel discussion on the role of Logistics investment and restart of economy, Dimitris Kympizis (Operations Manager) presented a case study on sustainable growth with the use of LED technology, and Babis Siaflas (Logistics & Commercial Director) participated in the general organization of the conference as a member of the board of EEL. SARMED announces its cooperation with another company from the beverages industry, expanding its portfolio of clients. 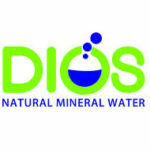 Specifically, SARMED is currently responsible for the transportation, distribution and storage of DIOS mineral water for Mentekidis SA ensuring the right conditions for safe transportation, maintenance and storage of products in the company’s warehouses. SARMED is pleased to announce its cooperation with Autohellas, member of Vassilakis Group and official representative and distributor of SEAT in Greece. This collaboration confirms the confidence Vassilakis’ group has towards SARMED’s services, as it takes on the integrated provision of transport, storage, technical service and distribution in the official dealer network of Autohellas for all imported SEAT vehicles (throughout Greece). Three prizes were awarded to SARMED at the ceremony of the Transport & Logistics Awards 2015 highlighting the best practices and innovative applications of commercial enterprises, industries, 3rd Party Logistics companies, ports and other transport infrastructure. SARMED was the big winner of the evening as it received the most awards in total, including the “Award ILME- Project of the Year 2016”, which is also a passport to the International Awards of Excellence “European Gold Medal in Logistics & Supply Chain”. The ceremony attracted 350 high ranking executives from the largest companies related to the transport and logistics industry in our country demonstrating the dynamic of this event in the field of Transport and Logistics. 1. Award ILME- “European Gold Medal in Logistics & Supply Chain – Project of the Year 2016”. The award was received by Mr. Yiannis Sarantitis, Deputy Managing Director. 2. Outstanding Award in the category Combined Freight Transport. 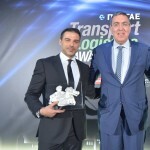 The award was received by Mr. Haralambos Siaflas, Logistics & Commercial Director. 3. Award for Excellence in the category Corporate Social Responsibility & Sustainability. The award was received by Mr. Dimitris Kympizis, Operations & Quality Manager. The 11th Conference of ECR Hellas entitled “Approaching the new reality,” with the participation of more than 600 executives from the retail and industry field, was held on May 12th at the “Antigone” hall of the Cultural Centre “Hellenic Cosmos”. SARMED participated as one of the sponsors plus while members of the company participated in the conference highlighting the importance of the logistics industry as a whole in the economy but also in retail. Those who attended were informed of all the new trends adopted by the retail industry, such as product innovation, modernization of production units, including the focus on technology and Corporate Social Responsibility. 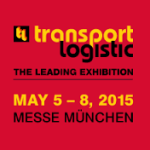 SARMED was present at the largest exhibition in Europe regarding transport logistics. Yiannis Sarantitis (Deputy Managing Director), Babis Siaflas (Logistics & Commercial Director) and Dimitris Karagiannis (Logistics Operations BU Director) attended from SARMED among other executives of international companies from around the world, discussing the latest developments in Europe and Greece for logistics. ARMED sponsored one of the largest conferences in the field of logistics titled «Solutions II» which was conducted by the Supply Chain Institute, on Wednesday, April 29. 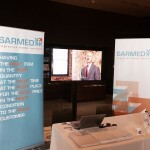 The company’s presence was reinforced with a booth equipped with promotional material while at the same time, SARMED executives held important discussions with large organizations. The conference attracted executives from leading companies operating in Greece, including university professors and journalists. The topics that were discussed focused on a number of methodologies and applied solutions that are able to be implemented by any kind of business. SARMED took over the transportation of a given category of E.J. Papadopoulos SA products to and from the Thessaloniki area by using the railway network. This action came in effect due to SARMED’s strategic cooperation with TRAINOSE which, apart from the environmental benefits offered to both partners, will significantly reduce transportation costs on the Athens-Thessaloniki axis. March 2015 | SARMED innovates by introducing solutions from Telenavis S.A.
Aiming for continuous improvement of processes and services offered to customers and partners, the leading supply chain management company SARMED, innovates by introducing the routing systems from Telenavis SA offering intelligent solutions for the effective management of deliveries, prompt and effective customer service, reducing the environmental footprint, minimizing kilometers and verifying deliveries. More specifically, SARMED’s technological investment has a dual application. On the one hand, an advanced automated routing system “Dispatcher” minimizes mileage for daily deliveries, which has an evident effect on improving delivery times and reducing the environmental footprint. On the other hand, the confirmation of the delivery system “Proof of Delivery” enables the company and its customers to have direct information on the status of the order and the exact time of delivery in real time. SARMED adds to its portfolio the world leader in air conditioning systems TRANE, taking on the sole management, storage, distribution and transportation of a wide range of energy efficient heating, ventilating and air conditioning (HVAC) available, while also undertaking the management, storage, distribution and transportation of specialized cleaning materials for Α2Ζ. SARMED’s blood donation team contributed 31 valuable units of blood this month to help our fellowmen who have immediate need for blood. The total supply of SARMED’s blood donation team is 182 units of blood, from the first donation to date. SARMED inaugurated 2015 by adding a worthwhile collaborator to its portfolio from the Food and Beverage industry, the importing company Premium Brands. 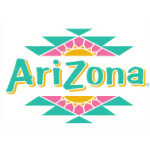 Specifically, SARMED undertook the exclusive management, storage, distribution and transportation of Arizona iced tea. On Monday, 19th January 2015, the Annual General Meeting of the Greek Logistics Association took place. Among the new members of the board that were elected, Mr. Charalambos Siaflas, Logistics & Commercial Director of SARMED, will serve a two year term as a member of the Board with the purpose of highlighting the potential role of the supply chain in supporting entrepreneurship and bolstering the national economy. Every year, SARMED contributes to strengthening the work of the association “Theophilos”, offering clothing, toys and food to families in need, just before the festive season of Christmas. The valuable contribution of SARMED’s employees was actively translated this year into objects, toys and food which were distributed to families with many children throughout the Greek territory. Furthermore, SARMED allocated a significant amount of money to aid two NGOs working close with children: The Smile of the Child and Children’s Villages SOS, thus encouraging as many businesses possible into this direction with corresponding actions. SARMED offered immediate transportation services to Roche Hellas, making it possible to jumpstart the collection of books in order to create the first lending Library by NGO Praksis. The book collection will be implemented biannually for the optimal organization of libraries and will operate throughout the year according to the structures of NGO Praksis. Mr. Yiannis Sarantitis, Deputy Managing Director of SARMED, presented on 21/11 at the OptimizeMed conference (a collaboration with PPA and Aegean University) at the headquarters of PPA, the services a 3PL operator can offer to a port operation station. In this context, there was a brief reference to services, infrastructure and SARMED’s clientele as well as the gaps that can be covered with the presence of a leading 3PL company for port freight services. SARMED confirmed its commitment to quality and to continuous improvement of supply chain services as well as the improvement of management of customs warehouses, following inspections by TUV HELLAS (TUV NORD), which certified recommendations by the Alimentarius Codex Commission (HACCP). The certification which SARMED received is recognition of its ongoing efforts to upgrade its services, to ensure the safety and hygiene of food and beverages in all stages of transport, distribution and storage from the largest food and hygiene certification body. SARMED announced the strategic agreement with TRAINOSE for the lease of the railway storage warehouse of 500 sqm at the commercial station in Thessaloniki. As part of the overall strategy and completing the development of the necessary infrastructure, successfully completes its effort to provide vertically integrated intermodal transportation services by using the railway. On October 23, the conference “The Supply Chain 10 years ahead”, organized by the Supply Chain Institute was successfully completed with its golden sponsorship of SARMED. At the conference, in the presence of over 300 delegate professionals from the field of Supply Chain, the Mega Trends of the Supply Chain were revealed. Furthermore, on 18-19 November SARMED was present at the 18th Panhellenic Logistics Conference in Thessaloniki. The upward trend of SARMED is presented extensively by Wall Street Journal in a video that you can watch on YouTube. This video was incorporated to mark the distinction of SARMED at the European Business Awards and presents interviews given by executives of SARMED. The content of the video refers extensively to the elements that contributed to profitability, the extended clientele as well as the qualitative and flexible services offered. SARMED operating as a well-established logistics service provider in Greece became officially a member of the ΕCG – The Association of European Vehicle Logistics. The services provided by SARMED, cover all stages of the supply chain, from the transportation of new vehicles from the moment they arrive in Greece until their final delivery to the official dealership network. SARMED’s client portfolio entails important customers which among others are: Hyundai, Mitsubishi, Toyota, Mercedes, Ford, Renault, VW & Audi. As part of its ongoing efforts for continuous improvement of processes and services offered to customers and partners, SARMED created a new department which deals entirely with Customer Service. This new organizational unit now gives the opportunity to have direct access to the new call center, to report any issue and receive an immediate answer / solution. The Customer Service department is equipped with specially-configured CRM system which records all cases, thus enabling follow-up and very detailed reports. Also through the Customer Service department, regular customer satisfaction surveys will be performed, the results of which will be communicated to partners if so desired. The distinguished company in frozen fish & seafood with a leading position in the Greek market and export activity, entrusts SARMED for the transportation of its products and door to door delivery to the majority of its network nationwide. With this collaboration SARMED substantially consolidates itself in the highly demanding field of supply chain management of frozen products, thus developing a reliable and efficient distribution network and adding to its clientele a longstanding partner. The commercial company of nuts and snacks, SELECT NUTS assigned to SARMED the integrated management of the supply chain and distribution of its products through the channel of super markets. As part of the development of its activities, SARMED proceeded to lease its storage space in the complex of freight warehouses in Mandra to the company DYNA PACK, concerning services such as packaging, repackaging, shrinkage and 3PL. Commence of cooperation with the company Gypsoplak with the object of taking over the full management of its supply chain throughout Greece. Commencement of collaboration with the production and packaging company MELINDA in northern Greece, for storage services of honey and confectionery goods. A proportion of the products that require cold storage conditions, based on our expertise are covered through our facilities of refrigerated compartments at our Logistics Center in Sindos, Thessaloniki. Maintaining its strategic interest in the Freight Centre of Thriasio, SARMED submitted a non-binding interest proposal at the invitation of the contracting authority GAIAOSE and participated in the first stage dialogue of GAIAOSE with interested tenderers to clarify the proposal data and analyze further the approach for the project. SARMED’s new logistics Hub in Aspropyrgos covering a total area of 6,000 m2 will provide integrated logistics services for third-parties (3PL). 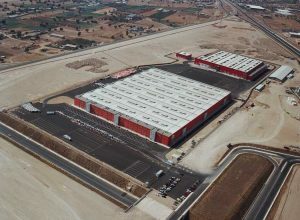 With this addition, the area of 3PL Operation increases to 73,000 m2 from a total of approximately 150,000 m2 of warehouse space, thus consolidating SARMED at the top of the logistics industry. Within the framework of outward activity and the effort for continuous improvement through mutual exchanges of experience and expertise, SARMED offers internship opportunities and job employment to graduates of Greek and foreign universities with specialization in Supply Chain Management and Logistics, after contacting respective institutions. As part of the implementation of the investment plan, with emphasis on environment-friendly technologies, SARMED is gradually replacing all kinds of incandescent lighting in its premises (external & perimeter lighting, warehouse lighting-bells, lighting in offices, etc.) with the latest generation of LED technology. In addition to environmentally friendly technology, the benefits of energy saving is estimated to reach in some cases 70%. This investment concerns the replacement of about 1.500 units which amount to 300,000 €. The new dynamic company operating in the field of cosmetics and toiletry entrusts the entire supply chain outsourcing to SARMED. SARMED’s blood donation team contributed 21 valuable units of blood, which helped our fellowmen who had immediate need for blood! The total supply of SARMED’s blood donation team is 151 units of blood, from the first donation to date. SARMED sponsored the successful congress of the Supply Chain Institute which provided solutions to the three most important issues in the market of logistics: Sales & Operations Planning, E-commerce and the development of 3PL to 4PL new value added services. Dimitris Kympizis, Operations & Quality Manager of SARMED presented together with Mr. Nick Sahinis, Commercial Director of RETAIL@LINK, the benefits and practices of e-invoicing with respect to the last session of the conference. SARMED was successfully qualified for the next round of the Basketball Tournament for Executives, which prevailed REAL CONSULTING after a thriller match that ended with a 2point difference for our team! Congratulations to the well-trained opponent! The tournament continues in September. Committed to its strategic plan for international development, seeking appropriate opportunities to build partnerships with perspective and added value, and after months of contacts, SARMED proudly announces the signing of a Joint Venture Agreement with Saudi Arabian business, Marei Bin Mahfouz Group & Co. with the aim of jointly setting up a company providing supply chain services. This coming September, we will begin a thorough inventory of all data on the local market in order to prepare a complete business plan. The goal is to start the activity from Jeddah, the largest commercial port in the country and gradually expand not only in Saudi Arabia but also in other countries of the Arabian Peninsula. Confirming once again the high level of service and continuing the successful cooperation with LIDL, SARMED undertakes the storage of deep freeze products for LIDL in Attica, including the transportation and supply to its central warehouses. Following the global framework as well as upgrading its structures and functions, this year SARMED disclosed its financial statements for the first time through the IFRS in order to have a more accurate, updated and transparent recording of financial data. Despite the difficult economic climate of the past year and the continued development and implementation of investment by SARMED, the trend was increasing in numbers. 1) Optimal Cooperative Relations with excellent performance for over 20 years of cooperation with the global industry in the field of forwarding & logistics, GEODIS. The award was received by Mr. Babis Siaflas, Logistics & Commercial Director of SARMED together with Mr. Paul Attallas, Key Account Business Development Manager & Industrial Project of Geodis Calberson Hellas. 2) Significant Investment Activity with excellent performance for the development and operation of the logistics center in Northern Greece -Sindos, where the award was received by Mr. Dimitris Karagiannis, 3PL Business Unit Director of SARMED. 3) Through the nomination of the company Retail@Link with high performance for the design, development & implementation of electronic invoicing with impressive results, the award was received by Mr. Dimitris Kympizis, Operations & Quality Manager of SARMED together with Ms. Britta Balden, CEO of Retail@Link. SARMED warmly extends its thanks to the Supply Chain Institute and Planning, including Boussias Communications for organizing the event and congratulates all the other companies who excelled. A brilliant event at the Westin Astir Palace Resort in Athens was conducted for the ceremony of the European Business Awards 2013-2014, which was attended by leading business representatives from Greece and Europe. Deputy managing director Yiannis Sarantitis, on behalf of SARMED, received the prestigious award as one of the top 10 companies in Europe with a turnover up to 25 million euros. SARMED would like to thank the organization of the European Business Awards and the judging committee for this honor including RSM Greece for the sponsorship of the institution and its support throughout the process. SARMED remains committed to the continued effort to provide high quality services, innovation, business ethics, corporate social responsibility and environmental orientation. After the successful collaboration for the transportation service, SARMED undertakes the whole management of the warehouse (including the customs area), providing integrated logistics services for all of its merchandise. The second largest brewery in Greece, MYTHOS (part of the Carlsberg Group), assigns to SARMED the transportation of its products from the point of production in Thessaloniki, to Athens. This transportation is performed by rail and is part of SARMED’s agreement with TRAINOSE for the use of its network regarding freight customers. In the effort to continuously improve its services, SARMED implemented electronic invoicing for the issuance of billing documentation. Our company collaborated on this project with Retail Link, a member of the Entersoft group. The result of the collaboration was the design of an integrated application, which communicates with the ERP of our company and enables the issued billing documents to be sent to the client and be registered in electronic form. This practice makes the task of billing faster and more flexible, ensuring added value and reduced costs both to our company and our customers. Finally, perhaps the most important outcome from the implementation of electronic invoicing is the dramatic reduction in paper use, which is consistent with the “Green Development”, one of the strategic objectives of SARMED. Honorary participation at the QualityNet Foundation workshop which was held at the Grande Bretagne Hotel in Athens, under the auspices of the Ministry of Development and the Ministry of Environment, Energy & Climate Change, with the participation of Greek and European politicians, social and business organizations, with the aim of discussing and adopting best practices for the signing of the Charter for sustainable development, which is based on three pillars: economy, society, environment. Plaisio SA, one of the largest computer, technology and office equipment retailers in Greece, assigns to SARMED the management and storage for its overstock products. SARMED undertakes to provide contract logistics services for the acclaimed winery SEMELI (Labels Semeli, Orinos Helios – Mountain Sun Rose etc). A catalytic role in the selection of SARMED was the absolute expertise, experience and strong network developed in the field of bottled product management and especially alcohol drinks. 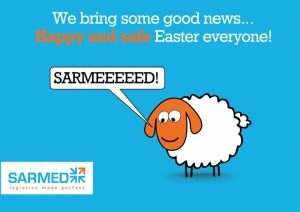 SARMED actively supports the efforts of EPSA, which this Easter will offer refreshments to various charitable institutions in Greece. Our company will offer some of the logistics services free for this work, by integrating and adding value to its customer and at the same time strengthening Corporate Social Responsibility policy which SARMED is committed to. Consistent with its commitment to continuous updating & monitoring of the latest developments and trends in the international scene of the supply chain, SARMED was present at the most renowned for its high-level international congress in Amsterdam, the Netherlands, where the heart of European logistics beats. The event consisted of presentations and workshops covering the full range of logistics functions including the latest data on technology, innovation, synergies, multimodality, greening and vertical integration. The leading hotel group with a network of 20 units in the largest tourist destinations in the country, entrusts SARMED the management of the logistics supply chain assigning international transportation, gathering, sorting and distribution of chilled products to the islands and mainland of Greece. The leader of teas (Dilmah) and food & snacks ALANKA chose SARMED to provide integrated logistics solutions for their products. The successful conference held at the Megaron Athens Concert Hall on March 28-30, had inter alia, the active participation of our company with the key note speaker, Mr. Babis Siaflas (Logistics & Commercial Director) giving a presentation on “Greek Supply Chain: Perspectives of a modern way of strengthening the economy and entrepreneurship” and who also participated in the expert panel supply chain analyzing all major industry issues in relation to entrepreneurship. Continuing the successful cooperation with 3E, SARMED undertakes the storage services for one of the main products of Coca Cola 3E, the bottled mineral water AVRA. Further development of activities in the food industry as SARMED signs the collaboration with the leader in snacks and packed confectionaries (BINGO), providing integrated logistics services for all its products. Our company supporting the development plan of the industry of used vehicles, launched two new partnerships with the following insurance companies: Interamerican and European Reliance. These two companies have entrusted the high quality of technical services provided by our company for repairs of vehicles which are covered by insurance, giving us the anointing of collaborating workshop. On the occasion of SARMED’s distinction at the European Business Awards, Yiannis Sarantitis, Deputy Managing Director, is being interviewed in the Fortune Greece Magazine. Expansion of cooperation with CARREFOUR MARINOPOULOS while SARMED undertakes the transportation and distribution of products for the dry cargo network in southern Greece. The market leading company ELBISCO, specializing in bread products and snacks, entrusted SARMED for its door to door distribution of its products in the region of Peloponnese, Aetolia, Epirus and Crete. The launch of cooperation with TRAINOSE for the transportation of SARMED’s clients products along the axle Athens – Thessaloniki (and vice versa Thessaloniki – Athens) marks the active and coordinated input of SARMED for combined, intermodal transport with all the advantages it offers (speed, accuracy, reduced environmental footprint, etc.). Theocharakis Group of companies took over the import of vehicles for Renault and Dacia. Both brands have excellent dynamic and expectations are high since they are managed by this experienced group. TEOREN in turn, chose our company to provide integrated logistics services for its vehicles. Success continues for SARMED by receiving the highly prestigious honor «Ruban d’ Honneur» at the pan European contest of the European Business Awards. SARMED ranked amongst the top 10 companies in its category (with a turnover of less than 25.000.000 €) in Europe! This distinction highlights businesses, regardless of the industry involved and guided beyond financial performance, innovation, business ethics, consistency and stability, long term planning and perspective. The approximate size of success is the fact that SARMED competed amongst 15,000 companies from 30 European countries and was judged by more than 150 judges from the European business, academic and political environment. This alone is a great distinction, but SARMED will claim the first prize in its category (along with the other 9 finalists and a total of 100 finalists from all 10 categories). The ceremony will take place this year for the first time in Greece since 2007, which is the inauguration of the European Business Awards. Consistent in its efforts to enhance openness and potential growth of the logistics chain in Greece and internationally, SARMED with great pleasure and honor shall support the activities of the Greek Logistics Company (EEL), the official scientific body of Greek Logistics, the following 12 months. Also true to the annual meeting of our industry, SARMED supports and enhances the 17th Panhellenic Logistics Conference through its sponsorship. Monday 11 November 2013 – SARMED will compete for the title of ‘National Public Champion’ in this year’s European Business Awards, as the public vote opens for the first time today. SARMED, already named as one of the national champions in the internally judged part of the competition, has submitted a video of its company online, giving an in-depth story of their business and its successes. It will now compete against all other country national champions for the public vote. The company with the most votes will be named ‘National Public Champion’ for Greece on 14th January. This first phase of the online voting is open from 11th November to 2nd January, giving SARMED 7 weeks to get as many votes as possible. The valuable contribution of SARMED’s 4th blood donation was 31 units of blood, helping our fellowmen who have immediate need for blood! The total supply of SARMED’s blood donation team is 129 units of blood from the first donation to date. 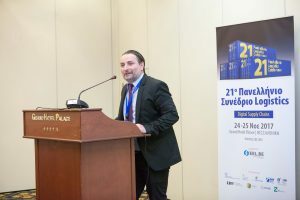 Yiannis Sarantitis, LPC (Logistics Permanent Committee) member and Deputy Managing Director of SARMED, participated at the Greek Logistics Workshop and presented his presentation regarding “Reforms for high-quality logistics in Greece: Views from the private sector”. SARMED participated in the visit at the trade center of Perpignan (Saint Charles International) in France organized by the company Kandor, the BSE and the Greek Society of Logistics. The purpose of the visit was to highlight the advantages of the application of network and intermodal supply chain. Meetings with entrepreneurs & operators and presentations on infrastructure and procedures were held. Our company was represented by Babis Siaflas (Logistics Manager) and Dimitris Karagiannis (Northern Greece Director). The European Business Awards (www.businessawardseurope.com) announced on 17/7/13 that SARMED is to represent Greece as a National Champion in the prestigious 2013/14 Awards programme. SARMED beat off stiff competition to be selected as one of 50 National Champions and will now compete for Ruban d’Honneur status in the next round of the competition. Final category Award winners will be unveiled in May 2014. The European Business Awards has identified some of Europe’s brightest businesses based on their ability to demonstrate the three core principles at the heart of the Awards programme. The esteemed panel of judges were looking for organisations to represent Greece who exhibited the highest levels of innovation, business excellence and sustainability. Our company sponsored the conference “Logistics partnership & National strategy: A 360o approach” from the BSE, the Greek Logistics company and the Ministry of Development, featuring as keynote speaker, Minister Mr. K. Hadjidakis. John Sarantitis (Deputy Managing Director) and Charalampos Siaflas (Logistics Manager) conducted a joint presentation on “Synergies in Logistics – Challenges for Greek enterprises”. BAUFOX, the pioneer company in building, energy products and solutions selects SARMED for the storage and distribution of its products. After the successful cooperation in inventory management, the German multinational company LIDL expands its cooperation with SARMED through the distribution network in Northern Greece. A German vote of confidence in Greek companies! Another multinational company, Italian Kerakoll, leader in the industry of building materials & solutions, is now collaborating with SARMED to serve its customers in Northern Greece (through storage and distribution of its products). Success takes even greater dimensions as SARMED was chosen among 18 companies that took part in the international competition. VECHRO, one of the most historic Greek businesses in products and paint systems, assigns to SARMED the management of its stock and distribution of its products throughout Northern Greece. Condor SA, one of the largest and most reliable importing – commercial businesses in the field of alcohol, entrusted SARMED the transportation and distribution of its products throughout the Greek territory. SARMED was a silver sponsor at the International Conference «Southeast European Intermodality» of the IFFAG&L which was held on 16 & 17 May 2013 at the Metropolitan Hotel, noting great participation and success. The already successful collaboration of 1.5 years with LeasePlan in the storage and transmission/distribution of its fleet, now extends to technical support, confirming the high level of services offered by SARMED and its philosophy for stable and long-term partnerships. SARMED thanks the administration of LeasePlan for its trust. SARACAKIS, one of the oldest and most powerful import companies in the car industry, assigned to SARMED the integrated management of new vehicles for the two Japanese giants it represents, HONDA and MITSUBISHI. With this latest honor and substantial addition, SARMED further reinforces its leading position in the car industry. SARMED’s Blood Donation Team continues its valuable contribution by collecting 29 units of blood! SARMED participated as a sponsor at the 4th International Exhibition Supply Chain – Manufacturing – Packaging – Logistics, during which there was a vast attendance of the public and professionals of the specific field. In the highly interesting and successful workshop «LOGI.C» which took place during the exhibition, John Sarantitis participated in a panel discussion regarding combined transport in Southeast Europe. SARMED undertakes training the staff of 3E in customs matters relating to alcoholic beverages, right after the new activity of the latter in the distribution of alcohol (Jack Daniels, Southern Comfort, Finlandia Vodka, Ouzo Plomari, etc.). SARMED also signed a cooperation agreement with 3E for the provision of Customs clearance services on the above products. The new website design is perfectly consistent with all the new trends in web design. The infinite scrolling gives the opportunity to have unlimited reading and listing information without frustrating turning pages. We have simplified the classification with discrete symbols (pictogramms) so navigating our services is easy and efficient. All pages designed are based on the color palette of our Corporate Identity – Orange, Blue and White in the background – with plenty of pictures for the best presentation of our activities. The news is placed on the homepage and with one click you are reading whatever you are interested in. The menu bar is followed by the use of scrolling to avoid going to and fro. Essentially the design of our corporate website follows the philosophy of SARMED: quickly and easily without wasting time but with absolute accuracy and safety! Creation of a new dynamic website using modern technologies such as AJAX and jQuery. This page is supported with a sticky menu that stays fixed to the top of the page, while much emphasis has been given to the loading time of the website, as the contents load asynchronously for greater speed. The news on the home page is integrated with the logic of infinite scrolling in order not to have pagination and viewing them through the use of lightbox. A decision to establish a committee to determine the National Strategy of Supply Chain (Logistics) was signed by the Minister of Development, Competitiveness, Infrastructure, Transport and Networks, Mr. Kostis Hatzidakis. The committee’s task is to seek and prepare proposals that focus on modern and major topics of Logistics, under a National Strategy for the Supply Chain. At the committee, which is composed of representatives of relative institutions, John Sarantitis, Deputy CEO of SARMED, was summoned amongst others, to confirm the recognition of SARMED as one of the most important and reliable companies in the field of Logistics. SARMED responded to the invitation of one of the top multinational consultancy firms KANTOR by participating in the Working Group for Networks Operations Supply Chain Division, with the support from the BSE and EEL. After 6 months of cooperation with SARMED in Southern Greece, EPSA assigns the storage and management of the distribution network in Northern Greece, where, due to the strong presence of EPSA, the volume of business is twice as much. This was a confirmation of the high quality of services provided by SARMED. Continuing its effort to offer social work, SARMED organized, right after the Christmas season, a large gathering of clothes, toys and other useful objects. These items were provided by the employees of the company and beyond. All the items collected, which managed to fill a truck, were delivered to the NGO community care “Theophilos” (http://www.theophilos.gr). Within the framework of the visit of the World Bank in Greece, instructed by the Task Force and the Greek government (through contacts with sectoral bodies and larger enterprises) aimed at “mapping” the Greek market supply chain and subsequent improvement actions proposed. The WB met with the executives of SARMED to emulate and record the positions and opinions of the staff as one of the leading and most reliable companies in the industry. 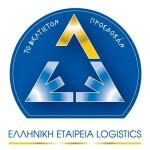 After the instigation of the promoting industry, the deputy CEO of SARMED puts himself at the disposal of the electoral body at the Annual Meeting of the Greek Society of Logistics, where, despite the absence of any kind of preparation and promotion he is elected at the management board as the official organ of Logistics. The confectionery company SARANTIS, selects SARMED as the sole 3PL partner for the next 2 years. As part of the upgrade of computer systems, SARMED completed the first phase of a project to upgrade the WMS (Warehouse Management System) in collaboration with the company SYNTHESIS. The budget for the first phase amounts to 85.000 €. SARMED is appointed contractor, following an international tender for the provision of logistics services for the office equipment of PPC. Commence of the work will probably take place in February 2013. SARMED issues a license for a customs warehouse (bonded warehouse) at the Logistics Center in the Industrial Area of Sindos covering a total area of 1,500 sq.m. The import company AMFOREFS, submits an application and issues a license for a bonded warehouse on the premises of SARMED in Mandra. Our company undertakes both logistics services for products of AMFOREFS and international transport to and from the warehouse. The national and international transport company INTERSPED selects the modern warehouse SARMED in Mandra for its know how to store and service handling. Ongoing outer action continues through sponsorship and a strong presence of SARMED at the 16th National Congress of Logistics. This is the event of the year for the relative business industry and scientific community, held at Zappeion. The participation of SARMED while covering a booth space at the Congress, presented a case study by Babis Siaflas (Logistics Manager) and the participation of John Sarantitis (Deputy Managing Director) at the panel of the conference (photo & video). The deputy CEO of SARMED was overwhelmed to accept the honorary invitation and participate in the “Initiative Group for Logistics” under the auspices of the Hellenic Society of Logistics and BSE. The objective of this think tank which comprised of leading companies in the industry such as shippers, 3PL and public entities, is the data processing industry and subsequently the preparation of proposals and actions for the optimization and promotion of services logistics in our country. The first action is to update the MasterPlan for Logistics in order to submit it with the competent Minister Mr. K. Hatzidakis. The Blood Donation Team of SARMED continues its valuable contribution by collecting 33 units of blood! Another bottle company entrusts SARMED as a sole partner of logistics. The Massokostas Bros which is a major importer of beer in Greece, including the premium brands Paulaner and Warsteiner included in our clientele. During mid-summer, SARMED expands its clientele in the bottle industry, where it has 15 years of experience and expertise, in full swing! July 2012 | Updated corporate identity by AEA RELATE S.A.
SARMED renews its corporate identity in the context of wider cooperation on communications strategy with aea relate. The objective is the strategic positioning of the company by showcasing its competitive advantages, experience, expertise and specialization in the field of logistics. The rebranding includes both the corporate site and printed materials and trucks and facilities of SARMED. The dynamic Greek company EPSA soft, assigns SARMED to provide integrated logistics services for its products in Southern Greece. Particular emphasis was given to procedures of Reverse Logistics, where our company possesses high expertise and experience and also comprises an important issue in the vast operations of EPSA. It should be noted that the task of the transition was very successful amid the peak of the summer season! (which is also the peak sales for EPSA). SARMED takes over the supply in consumer products and promotional materials for gas stations Coral (formerly Shell). This cooperation is triangular with the other partner DMG Press, at sales management level. Collaboration with Marinopoulos Group is extended in northern Greece. Carrefour entrusts SARMED in the distribution of its products (including both dry and refrigerated cargo) from the central warehouse at Drimos across its network in northern Greece. The German multinational chain discount super markets LIDL, which belongs to the clientele of SARMED, uses the new LC in Thessaloniki for the storage and handling of its merchandise. 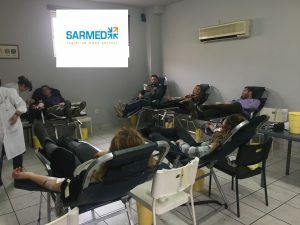 The newly formed “SARMED Volunteer Blood Donors” group, which already counts up to 60 members, stated its dynamic presence at the first voluntary blood donation, held on the company’s premises on the 15th of March, 2012. Thirty nine (39) blood units were collected by the Red Cross, that surrounded with remarkable warmth our group’s effort. SARMED expands its already successful partnership with VW & AUDI group (working with KARENTA since 2010) by undertaking the transportation of the whole of the imported vehicles, after signing an agreement with KOSMOCAR, official importer of VW & AUDI vehicles in Greece. SARMED would like to deeply thank the administration of the Group for its trust. This way, our company reaffirms its leading position on the vehicle logistics market, and moves steadily ahead, in spite of all the difficulties this field faces in our country. Applying its plan of Corporate Social Responsibility, SARMED actively takes part in the big reforestation of mount Penteli on 11/12/2011. The company’s contribution is 1.500 two-year-old pine trees, 50-60 centimeters high each. The choice of those plants was made based on the greater probability of the plants’ survival after the planting. November 2011 | Launch of cooperation with HYUNDAI HELLAS & KIA Motors. The fourth larger group of vehicles import in Greece, P & R Davari, trusts its transport services with SARTRANS , SARMED’S subsidiary transporting company. SARMED SA expands its long and successful cooperation with MOTODYNAMIKI group, by undertaking the transport and storage of PORSCHE vehicles, whose official dealer / importer is MOTODYNAMIKI. The most prestigious and demanding companies, as PORSCHE, choose companies of high fidelity, like SARMED. Sarmed expands and enhances its clientele on the used vehicles fleet management, by adding Lease Plan , the Greek subsidiary of a global player with a leading role in the European car leasing market. Lease Plan’s decision to cooperate with SARMED rewards our efforts on high standard services and proves the present tendency that big companies choose strictly reliable and trustworthy partners. The excellent long-term partnership with 3M HELLAS providing specialized warehouses and production facilities (Scotch Brite, etc.) was confirmed by the expansion of our cooperation by the full outsourcing of their supply chain services (3rd Party Logistics). The beginning of this collaboration with 3M, the leading company in manufacturing products of all kinds totaling over 70,000 codes, certifies the high quality of specialized services SARMED provides. After an extensive series of thorough controls at all levels of operations of the company, from the financial standing and creditworthiness, to the safety of facilities and data security, SARMED was certified by the Ministry of Economics and the General Secretariat of Information Systems as an Authorized Economic Operator (AEO). This is a certification which gives the company an additional safeguard and prestige, especially for its credibility to the international companies. SARMED SA expands its clientele in the wine field, on which we have developed the know how of 13 continuous years, with the historical winery of MALAMATINA. The cooperation regards in vertically integrated 3PL services for southern Greece. NAVICAR, owner and operator of the official points of sale of PORSCHE and LAND ROVER vehicles in Greece, confided in SARTRANS for the national transportation of its vehicles. SARMED continues its effort to offer social work, by organizing a collection of clothes toys and other useful items. These items were offered by employees of the company and other people. All collected items, which managed to completely fill a truck, were delivered to the Non Government Organization “Theophilos” ( http://www.theophilos.gr ). May 2011 | Beginning of cooperation with Assimakopoulos Ltd. The representative of INVENTOR Air Conditioning systems, Assimakopoulos Ltd, commissioned our group for the management of its products for the Greek market. PGA HELLAS, the official importer in Greece RENAULT and DACIA vehicles, renewed its confidence in SARMED, for the integrated logistics management of its vehicles from the point of entry in Greece, storage, customs clearance, technical services, and transportation to its dealership network. E & S MOTORS, the importing company of LIFAN motorcycles & scooters began cooperating with SARMED in the integrated management (import, storage, customs clearance, picking, transport) of their products. Craft, the pioneer Greek brewery began a cooperation with SARMED in the sector of collection and distribution of both bottles and barrels, relying on the experience of SARMED’s fleet and distribution network on alcoholic beverages. The largest company in Europe in the production and distribution of sugar confided in SARMED the storage and distribution of its goods. Completion and opening of two new storage complexes with office spaces totaling approximately 10,000 sq.m. in the region of Thriasio. December 2010 | Beginning of cooperation with ALES GROUPE HELLAS S.A.
Ales Groupe Hellas, a subsidiary of the French group Ales Groupe and the top dermocosmetic care products LIERAC, PHYTO and PHYTOSOLBA COLOR, assigned to Geodis Calberson and them to Sarmed the integrated Logistics services for the demanding management of their products .